Hazelfield Farm tomato plants are relatively new to the world of tomato varieties. Discovered by accident on its namesake farm, this tomato plant has become a workhorse, thriving even through hot summers and droughts. They taste good, too, and are a great choice for any tomato lover’s vegetable garden. What is a Hazelfield Tomato? A Hazelfield Farm tomato is medium in size, weighing about a half a pound (227 grams). It is red, slightly flattened and round with ribbing on the shoulders. These tomatoes are juicy, sweet (but not too sweet), and delicious. They are perfect for eating fresh and slicing, but they are also good canning tomatoes. Hazelfield Farm history isn’t long, but the history of its most famous tomato is certainly interesting. The farm in Kentucky introduced this new variety in 2008 after finding it as a volunteer in their fields. It outgrew the tomatoes they were actually cultivating and thrived in a particularly dry and hot summer while other tomato plants suffered. The new variety has become a favorite at the farm and at the markets where they sell produce. 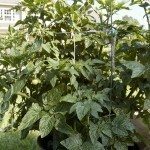 This is a great new variety for people in warmer and drier climates than are generally tolerable for tomatoes. Growing Hazelfield Farm tomatoes is otherwise similar to other varieties. Make sure your soil is fertile, enriched, and well tilled before planting. Find a spot in your garden with full sun and space the plants out about 36 inches, or just less than a meter. Be sure to water regularly throughout the season. Although these plants will tolerate drier conditions, adequate water is ideal. 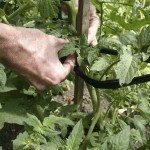 Keep them watered, if possible, and use mulch for retention and to prevent weed growth. A couple of applications of fertilizer throughout the season will help the vines grow abundantly. Hazelfield Farm tomatoes are indeterminate plants, so prop them up with tomato cages, stakes, or some other structure that they can grow on. These are mid-season tomatoes that will take about 70 days to mature.